The word “smartphone” came with force in the common language to describe phones with more advanced features.These devices are not only equipped with a radio module for voice and data exchange but also office functions (calendar, address, note taking, email, book …) and multimedia features (photo, music, video, games, web browsing). Looking at the smartphone market in past, we find that it is RIM, Palm, Windows Mobile and Symbian OS (Nokia) that dominated the market. Today, Palm no longer exists, RIM should represent about 4% of the market, Windows and Symbian 3% about 1% of the market, Nokia is now upgraded to Windows. It is of course Google Android and Apple iOS dominate with 90% of the market , two players who did not even exist in past. To resume this stats , there is no better than to show this informations into amazing infographics. Here we have crawled the web and found 25 really informative infographics related to smartphones. Losing a phone can turn your day upside down — but if you’re not careful, the impact can be far worse than that. With identity theft on the rise, it is more important than ever to make sure that all the data on your phone is safe and easily recoverable in case the device is lost or stolen. Please check out these precautionary tips to keep your phone and personal data safe. The Dialaphone team have put together an infographic detailing the history of smartphones and how handset technology has changed over time. From the humble IBM Simon to the devices of today smartphone technology has progressed immeasurably in the last few years. But which operating system has become the most popular? And how has technology converged from multiple devices into a single small rectangular handset that we can slip into our pockets? We take a detailed look at the Smartphone Revolution. Top 10 reasons to get a smartphone. If you want to buy one, but you’re not sure yet, check out this infographic and see why and how it can make your life easier. A survey of a UK employees and their preferences for Smartphone usage and purchasing habits. Lost, Stolen Or Damaged Smartphones: The Facts! Can you imagine a world without the mobile phone? Nope, me neither! It is the most indispensable gadget of the new millennium and its importance and our reliance on its technology increases year after year. This makes it even more depressing when a phone is lost, stolen or damaged. It’s pretty important to have mobile phone insurance when there is so much at risk, but according to a recent survey, 63% of mobile phone users have no insurance. We all know how much an iPhone 5 is to replace, don’t we? Imagine having to pay for a new one out of your own pocket? Ouch! The top three places to lose your phone include coffee shops/cafes, the workplace and bars/restaurants, so be careful when you’re out and about. Take care of your phone, and be wary of using it excessively in public places where they could be thieves about! Being careful and vigilant will ensure you and your phone will have a long fruitful relationship. Smartphone users are getting higher each year and this infographic illustrates how this can become a demand to individuals. In an estimate of 7 Billion people in the world, there were already 1 Billion active smartphone users. This is based on a 16 years long to reach this number but soon enough can go up just easily. In the United States, 45% were already using smartphones and 85% stick with cellular phones. This can be due to a higher maintenance and expenses with smartphones where most households can spend thousands of dollars just for their phone services alone. A $67 increase in family expenditures were estimated as their food spending are going down by $48, apparel fell by $141 and non-phone entertainment like books and DVDs fell by $126. Due to this demand, $100 Billion were already spend for mobile media globally in 2011 and will continue to rise in the future as technology is getting better and better. Global manufacturers that also have global OEMs are working hard to create a huge sale and the known manufacturers now are Samsung, Apple and HTC. Hundreds of millions of people use all kinds of smartphones and tablets. It is not just iPhone and iPads there are almost half a dozen major smartphone manufacturers and almost than many mobile operating systems in the market. For businesses planning to develop mobile apps, it is important to know which operating systems and which devices are doing well in the market. In this infographic, we first take a look at how people use their mobile phones and tablets Who uses tablets more businessmen, children or the elderly Which gender uses more smartphones men or women What kind of apps sells well in the app store All these and other questions are answered below. Starting with the use of signal drums to send messages in ancient Africa and finishing with the advent of social media at the beginning of the 21st century, it portrays how communication methods have evolved, the hard work required, the decline and disappearance of some methods, and finally raises the question – where can we go from here? Research by UK telecommunications regulator; OfCom has given us a deep insight into the smartphone market and the data consumption of mobile users. Are we now in a world of smartphone and technological addiction? Figures plucked from the report indicate that 23% of adults and 34% of teens admit to using smartphones during mealtimes. We can’t seem to let our mobile phones go wherever we are, illustrated by our beautiful infographic. This infographic tells people how to keep their smartphones safe from hacking. Smartphones are pretty much the must have necessity of modern times. They have evolved from cell phones from the late 20th century that were only able to make phone calls, to being able to do much, much more. The average smartphone can: – make phone calls (or course) – send text messages – get driving directions – enable online shopping – check the weather – check the stock market – listen to music – watch movies – play games and much much more. In the age of social media and mobile apps, small businesses are expected to constantly be connected. With more and more small business apps hitting the market, managing certain aspects of your business on-the-move has never been easier. Connect with your customers, manage your finances, and even make transactions with these 13 fantastic mobile apps! Findings from latest Pollfish survey regarding smartphone usage. Evolution from telephony & sms to online voice & instant messaging apps is in progress. 7 out of 10 mobile users have seen their lives getting better with the use of smartphones! This infographic by ProtectYourBubble breaks down smartphone incidents by gender and age group. Do you see any surprises? Games continue to be the most popular app category, and according to Nielsen research, 93 percent of app downloaders — those who have downloaded an app within the past 30 days — are willing to pay for the games they play. In contrast, only 76 percent of downloaders are willing to pay for news apps. As smartphones shift from the realm of early adoption to mainstream use, the demographics of smartphone users are also shifting strongly. A new UK survey has found that more women are using smartphones now than men, and in general users are increasingly older. Smartphones are awesome. They keep us connected to friends, help with directions and give us access to the Internet’s infinite wonders. But how awesome is too awesome? And when does appreciation become addiction? 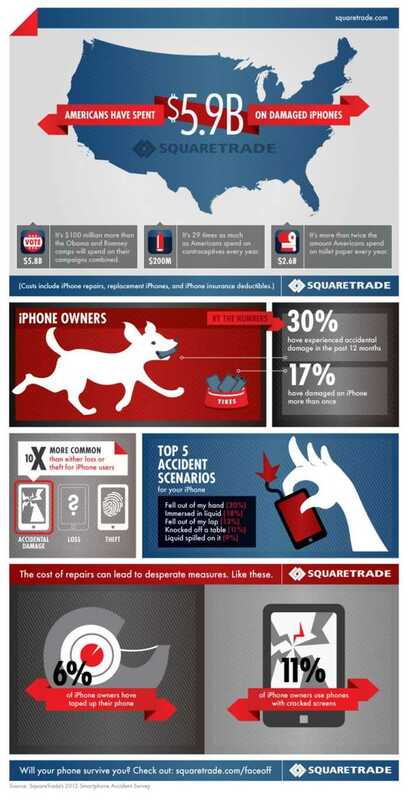 A look at what kind of accidents people have with their iPhones and how much they spend on repairing them. Over the past 100 years or so, various technologies have radically transformed our life. However, different technologies get adopted at different rates, and it seems like smartphones which have everything from video editing apps for Android to online banking, may be the fastest spreading technology in history. StartApp’s infographic explores the world of Android apps. Mobile phone ownership in Ireland is getting younger and most of today’s teenagers (15-18), those in their early 20s (19 to 24) and late 20s (25-29) got their first mobile phones between the ages of 11 and 15. However, in terms of design and marketing, these markets are not being targeted very well in Ireland. That smartphone in your pocket can be used to check football scores , catch up on the latest news and celebrity gossip or it can help save your real money every day.